Aphotic Realm is a brand new magazine dedicated to strange and sinister fiction. Recently they have produced their first issue themed around - Apparitions. 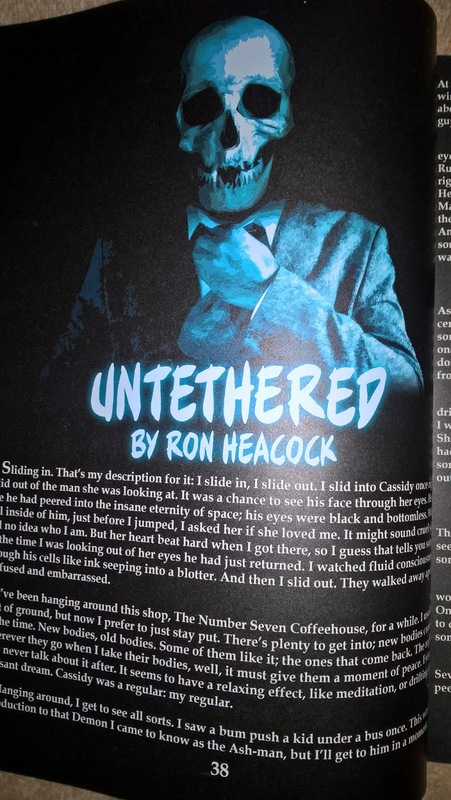 If the first issue is anything to go by this horror fiction magazine is going to be making some big waves on the horror scene. This issue is available both in print and kindle but do buy it in print it is worth every penny. The content is absolutely divine. The magazine is full colour and in each page you can see the love and care that has been poured liberally over each page. 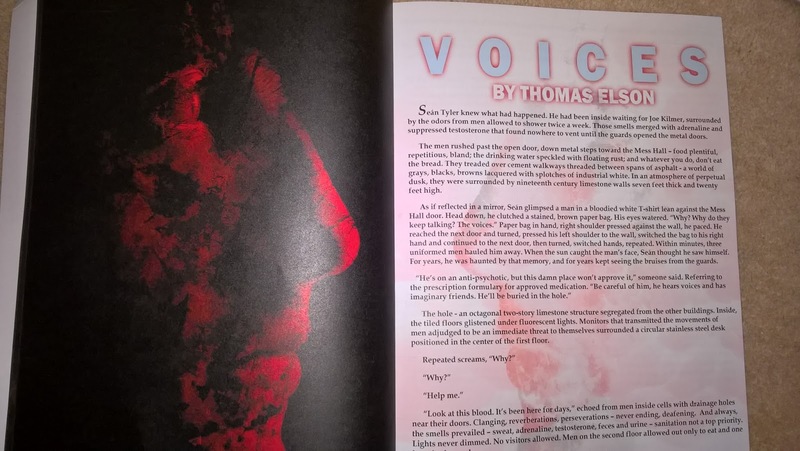 Each story comes with it's own illustration, shout out to Gunnar Larsen for his amazing artwork. So before I'd even started reading the stories I absolutely fell in love with it! there are real life ghost stories in here and they're not pretty! This is a really strong anthology, I really enjoyed all the stories in there, no duds whatsoever. 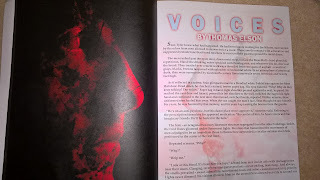 Voices by Thomas Elson makes a really strong start. It's one of those stories that you have to read again straight away! Blue Vial by Tevis Shkodra is a heart wrenching tale of love and loss which I found incredibly moving. The Shadow on the Stairs by Brianna Fenty is just downright terrifying!!!!!! I absolutely adored Waternish Boy by Christopher Stanley who focuses on ancient Scottish folklore. 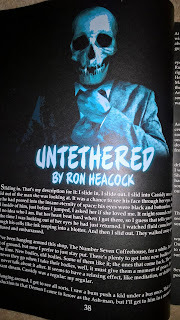 Untethered by Ron Heacock is amazing. This was my favourite tale, ( a very hard choice, all were amazing.) I was genuinely sad when it ended and was left needing to know more. This is one story that I could see being turned into a full length novel! Whispers Beyond the Veil by Chris Martin is a terrifying true account of an American haunting. If a Ghost Comes Knocking by Steve Carr is a really sinister tale that proves ghosts aren't as harmless as they look. Steve Hosking goes for a fantasy horror feel with The Princess & The Tower which takes a familiar fairy tale and turns it on it's head making it into something really original. Former Self by Kenneth Tilford JR is a great cop tale with a spooky angle to it. Rosanna Fields by Thor Morten (whoa cool name!) is a really epic tale, don't want to say too much about it in case I give too much away! Finally A.A.Medina tells us of his spooky encounter which is just really disturbing!!!! There's also an interview with Roland Mann: Comic Book Creator, Author, Editor and Professor and has some really good tips for writers and how to make it big. Gunnar Larsen shows off his artistic prowess with some super creepy art. Matt Peters owner of Beating Windward Press offers his tips and advice to writers. The second issue of Aphotic Realm is due out October - November 2017 and I just can't wait!! !